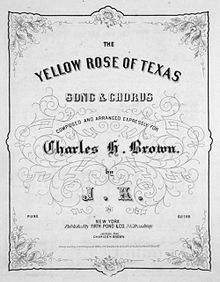 "The Yellow Rose of Texas" is a traditional American folk song dating back to at least the 1850s. Members of the Western Writers of America chose it as one of the Top 100 Western songs of all time. Several versions of the song have been recorded, including by Elvis Presley, Willie Nelson and Mitch Miller. The earliest known version is found in Christy's Plantation Melodies. No. 2, a songbook published under the authority of Edwin Pearce Christy in Philadelphia in 1853. Christy was the founder of the blackface minstrel show known as the Christy's Minstrels. Like most minstrel songs, the lyrics are written in a cross between the dialect historically spoken by African-Americans and standard American English. The song is written in the first person from the perspective of an African-American singer who refers to himself as a "darkey," longing to return to "a yellow girl", a term used to describe a light-skinned, or bi-racial ("mulatto") woman born of African/African-American and European-American progenitors. The soundtrack to the TV miniseries James A. Michener's Texas dates a version of the song to June 2, 1933 and co-credits both the authorship and performance to Gene Autry and Jimmy Long. Don George reworked the original version of the song, which Mitch Miller made into a popular recording in 1955 that knocked Bill Haley & His Comets' "Rock Around The Clock" from the top of the Best Sellers chart in the U.S. Miller's version was featured in the motion picture Giant, and reached #1 on the U.S. pop chart the same week Giant star James Dean died. Stan Freberg had a simultaneous hit of a parody version in which the bandleader warred with the snare drummer, Alvin Stoller, who also featured prominently in Miller's arrangement. Billboard ranked Miller's version as the No. 3 song of 1955. The "Dearest Mae" and "Rosa Lee" referenced in the song are the titles of two other songs also appearing in Christy's Minstrels songbooks. Twenty-five years later, the lyrics were changed to eliminate the more racially specific lyrics, with "soldier" replacing "darkey"; and the first line of the chorus, "She's the sweetest rose of color" (a reference to the African-European free people of color) changed to "She's the sweetest little flower ..."
"Dearest Mae" is replaced with "Clementine" in some variant versions of the song. In September 1955, for six weeks, Mitch Miller had a Billboard number one hit with "The Yellow Rose of Texas", and 13 months later, Miller's hit version was used for a key scene in the 1956 Texas-based film Giant. Miller's lyrics used "rosebud" and no words - except the term "yellow" - to indicate either Rose or the singer was a person of color. The 1955 song became a gold record. The song achieved the #2 position in the UK and the #1 position in Australia. Gene Autry & Jimmy Long - recorded for Melotone Records on March 1, 1933, catalog No. 12700. Bing Crosby recorded the song in 1955 for use on his radio show and it was subsequently included in the CD So Rare: Treasures from the Crosby Archive (2010). Michael Holliday - a single release in 1955. The modified lyrics reference famous Confederate military commanders Joseph Johnston, P. G. T. Beauregard, and Robert E. Lee. Texan veterans sang it openly to mock Hood's mishandling of their Nashville campaign. In this version of the chorus, "soldier" replaced "darkey." The same substitution is made throughout the song. In 1984, country music artists Johnny Lee and Lane Brody recorded a song called "The Yellow Rose," which retained the original melody of "The Yellow Rose of Texas" but with new lyrics, for the title theme to a TV series also entitled The Yellow Rose. It was a Number One country hit that year. ^ "Willie Nelson sings on Jimmy Sturr's 'Greatest Hits of Polka'". ^ "SteynOnline". steynonline.com. Archived from the original on 2009-09-12. ^ "The Yellow Rose of Texas Song Lyrics". tamu.edu. ^ Whitburn, John (1983). Top 40 Hits 1955 to present. New York: Billboard Publications, Inc. p. 188. ISBN 0851122450. ^ "MITCH MILLER lyrics - The Yellow Rose Of Texas". oldielyrics.com. ^ "The Online Discographical Project". 78discography.com. Retrieved December 10, 2017. ^ "A Bing Crosby Discography". BING magazine. International Club Crosby. Retrieved December 10, 2017. ^ "allmusic.com". allmusic.com. Retrieved December 10, 2017. ^ British Hit Singles & Albums. London: Guinness World Records. 2004. p. 235. ISBN 1-904994-00-8. ^ "45worlds.com". 45worlds.com. Retrieved December 10, 2017. ^ Lanning, Michael Lee. Civil War 100: The Stories Behind the Most Influential Battles, People and Events in the War between the States. Sourcebooks, Incorporated 2006. ISBN 978-1-4022-1040-2 p. 306. ^ Walker, Gary C. The War in Southwest Virginia 1861-65. A&W Enterprise 1985. ISBN 0-9617896-9-7 p. 130. ^ Whitburn, Joel. The Billboard Book of Top 40 Country Hits. Billboard Books. p. 54. This page was last edited on 5 February 2019, at 05:39 (UTC).